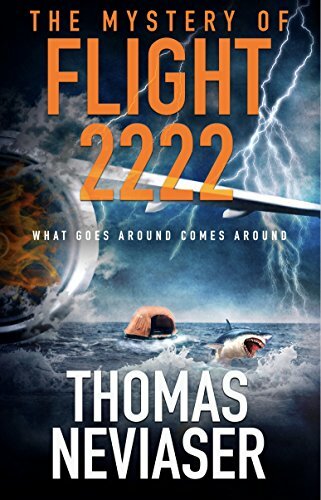 If you’re looking for a book that carries you along by the seat of your pants, setting you down only to land on your head, then check out The Mystery of Flight 2222 by Thomas Neviaser. Note: I received a free copy of this book in exchange for an honest review. I am a participant in the Amazon Services LLC Associates Program, an affiliate advertising program designed to provide a means for me to earn fees by linking to Amazon.com and affiliated sites. I will always give you my honest opinion on something before linking to it. I knew from my previous encounter with one of Neviaser’s books, You Dear, Sweet Man, to expect the unusual. At first, however, this book seems like a fairly “normal” journey of a man and his fellow passengers after their plane crashes and they’re lost at sea. We get just a taste of the background of each character as they’re introduced, and it’s just enough to keep the reader wondering why these particular people become a part of the story. During their time at sea, this book reminded me a lot of Life of Pi, a novel that has stuck with me for many years for its stunning imagery and tone. The Mystery of Flight 2222 pulled me in, making me wonder just how these people were going to get through their ordeal. It was at times frightfully realistic and disturbingly uncomfortable, but I couldn’t put it down. It’s not until the very end that the real twist–the one I’ve come to expect now from the author–comes along. I won’t spoil it for you. Go find out for yourself. What I Loved: Deep, realistic characters, fantastic imagery, and a dynamic plot. What I Didn’t Love So Much: At first, I wished the characters had a little bit more depth on their backgrounds as they were introduced. By the end, I realized that this was completely intentional. While this isn’t your standard Hollywood ending–and I admit I do like a good Happily Ever After–it was the perfect conclusion. Rating and Recommendation: If you like a good adventure and survival story that’ll throw you for a loop at the end, I highly recommend The Mystery of Flight 2222.